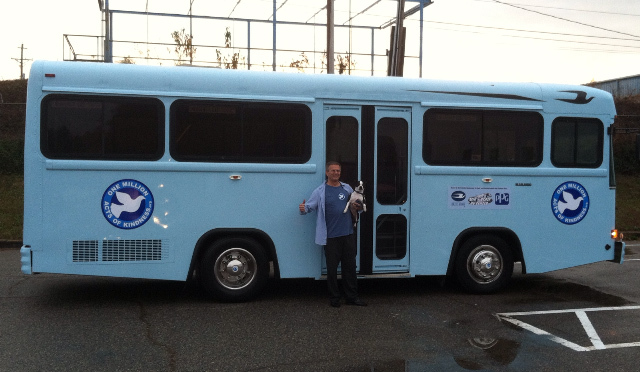 Thank you to the Blue Bird Corporation for the generosity of a donation of a very nice bus. This will insure that our travels will continue for several years to come. This entry was posted on Friday, December 6th, 2013 at 6:56 am	and is filed under Kindness. You can follow any responses to this entry through the RSS 2.0 feed. You can leave a response, or trackback from your own site. That is one sharp looking bus!!! That was amazing what Blue Bird company did to help promote kindness. There’s no stopping you now!!! Are people who visit with you going to be able to paint their thoughts? I hope so . . .